Ring had been told by the residents of the area around Frederiksværk that the painter J. Th. 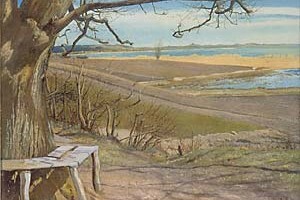 Lundbye had sat on this very bench when he painted his panoramas of the lake Arresø. Even if the story was not true, Ring exploited its mythological ambience to both emphasize and disguise his own position. On the one hand he could pay tribute to Lundbye as the incarnation of a golden age; on the other hand, precisely through Lundbye’s absence, he could comment on the collapse of the Golden Age construct on the threshold of the twentieth century. The picture is intense in its down-to-earth realism, and at the same time the bench stands – as the central focus – shining white and glaringly empty like a concentrated image of absence. The actual landscape, which was viewed in the Golden Age as the wellspring of ideal values, vanishes in a correspondingly empty way behind the bench. The bare surfaces of the lake and the fields have no particularly emphatic features, but envelop one another meaninglessly. The decayed trunks of the trees effectively close off the left edge of the picture and thus also any backward gaze. At the same time the top branch points to a new, not yet explored domain. L.A. Ring was one of the most prominent representatives of Realism in Danish art. He was the son of an artisan, and himself trained as a house painter until he was admitted to the Royal Danish Academy of Art. Throughout his life he stuck to his origins, both personally and in his work. He took his name from the little south Zealand village where he was born, and the rural population and its surroundings became his constantly recurring subject. The raw and direct realism was characteristic of Ring’s paintings. He viewed the world with a piercing look, which was painfully sharp and merciless.